I made this back when Superior Farms sent me some of their lamb to sample. 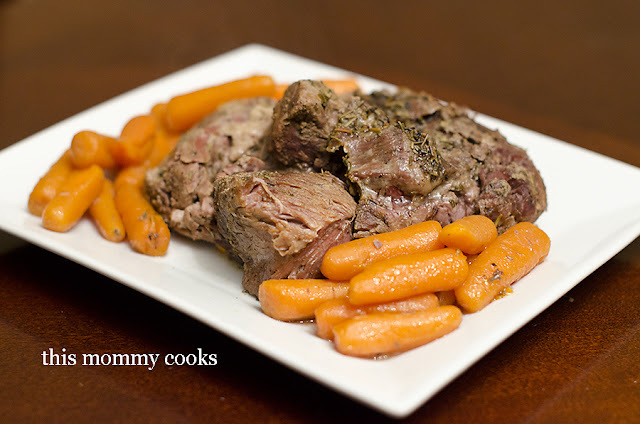 It was delicious, and a plus for this recipe, it's a slow cooker recipe! Put lamb in crock pot, fat side down. Sprinkle rosemary, salt, pepper, and garlic on top of lamb. Pour beef broth on top and top with chunks of butter. Cover and cook on high for 4-6 hours. About two hours before cooking is done, add in carrots. Yes, Rachel, you could definitely use a piece of meat with bone in it, and you could probably add potatoes too!